We are proud of our architectural heritage and support the preservation of this important aspect of our culture. Our award winning historical restoration and renovation projects include pioneer buildings built in the late 1800’s, recent mid-century modern houses, and projects by local celebrity designer and inventor Art Troutner. 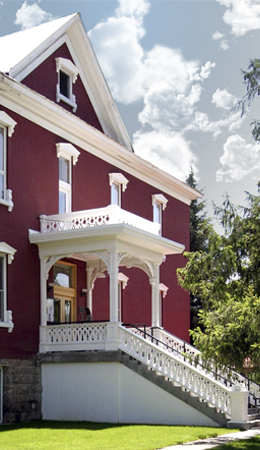 Our historical restoration and preservation project designs are developed within the National Park Service Guidelines and with the local State Historic Preservation Office. We are mindful of a building’s history and construction. We diligently research existing data and lore of our project buildings to develop a historical context, understanding and appreciation of the times and building. Steve Trout is certified as meeting the Secretary of the Interior’s Professional Qualification Standards (36 CFR Part 61) for Historic Architecture. We have accumulated and developed many techniques and methods for the adaptation of historical buildings for life safety and accessibility codes with the least amount of disturbance to the historic fabric. In most instances, the modern user is not aware of these alterations. Other required elements such as a new exit stair from the second story and accessible restrooms are added with a delicate touch to the existing historic building.